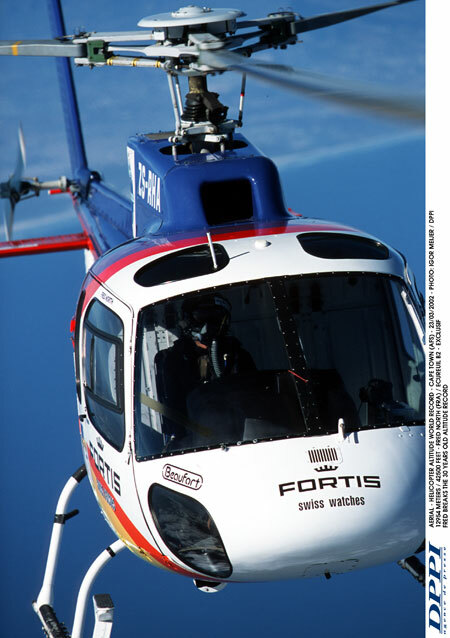 About thirty years after the record set by Jean Boulet on a SA315 B “Lama” helicopter, Fred North, professional pilot, takes an AS 350 B2 “Squirrel” to the fantastic altitude of 12954 m.
A light 5-6 seats helicopter, no matter which one, was not built to fly that high. This type of aircraft was more likely to do short connections at low altitude, while having the necessary infrastructures peculiar to planes. On the other hand, flights in the mountains often required highly powerful helicopters capable of exceptional taking off. In its own time the SA315B “Lama” met this need. It worked so well that dozens of them are still operating nowadays, especially in mountainous areas. Even so the weight/power ratio was less lucrative than the lama’s, the AS350 B2 “Squirrel” helicopter met as well the needs of the aerial operators asked to work in inaccessible zones particularly in altitude. When he decided to go through with his record project, Fred North didn’t think twice. His attempt, he would do it on a B2 Squirrel. But his target, even with a modem and trustful engine, still had to go through more difficulties. During the previous months, before the D-day, Fred approached the manufacturer and the motorist (Eurocopter and Turbomeca) while contacting the Civil aviation Authority, representing the French Minister of Transports. None of these three would value this quite peculiar request. The unfortunate negative answers from the “officials”, pointed out the risk incurred by Fred North, risks judged vain even from the industry more concerned by the market than by “spectacular” performances. Nevertheless, precious help would come. And not the least important. Jean Boulet, the owner of the world record certified by the international aeronautics federation, re-opened his files and offered Fred North to consult his flight report,dated June 1972. This valuable document contained basic information. For this intrepid pilot, this help is going to be decisive. As the French ministry didn’t seem to authorise this record attempt, Fred North went in search of another more welcoming site. Why not South Africa?” I had good memories of aerial work I had over there. Furthermore, the weather conditions, at this time of the year, are ideal. International airport of Cape Town, South Africa. The weather was fantastic. 200 kilos Lighter compare to its normal configuration, the Squirrel took off. Total weight of 1048 kilos. With 25% of fuel in the tank (132 litres) and minimum equipment on board – a little VHP radio, verticalmeter, un altimeter, the instrument engine indicators and transponder mode C-Fred crossed his fingers. His trust in his colleagues was total. But it was on his shoulders that the hopes relied. The South African civil aviation authorities, enthusiastic, watched over. His friends, tense but happy for him, were supporting him. No reverse gear was possible! “I didn’t want to do it anymore. Too much pressure and the risks even though they were calculated; it was difficult on a psychological level. But of course it was too late to give up…”confessed Fred North. 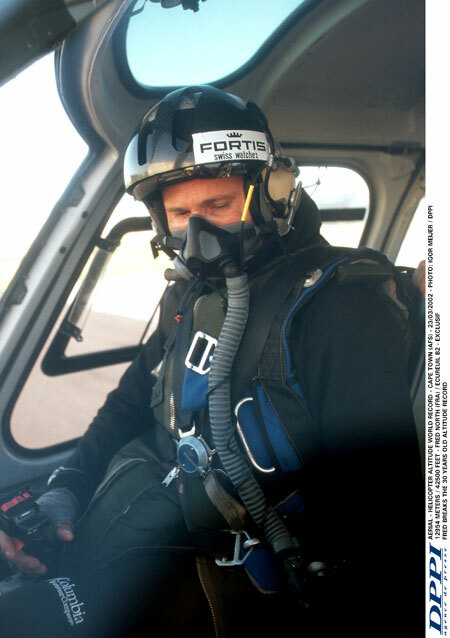 A previous test flight had been necessary for the pilot to understand the high altitude-he went up to 10000 m “just to have a look” – but still the uncomfortable unknown remained. The ascent started. Everything was fine on board. Stress was rising and would be present all the way through. Fred didn’t enjoy the view of the clear blue sky. The magnificent Cape ofGood-Hope showed the extreme limits of the continent in between the two oceans. The sunlight, getting brighter and brighter, irradiated the interior of the Squirrel. 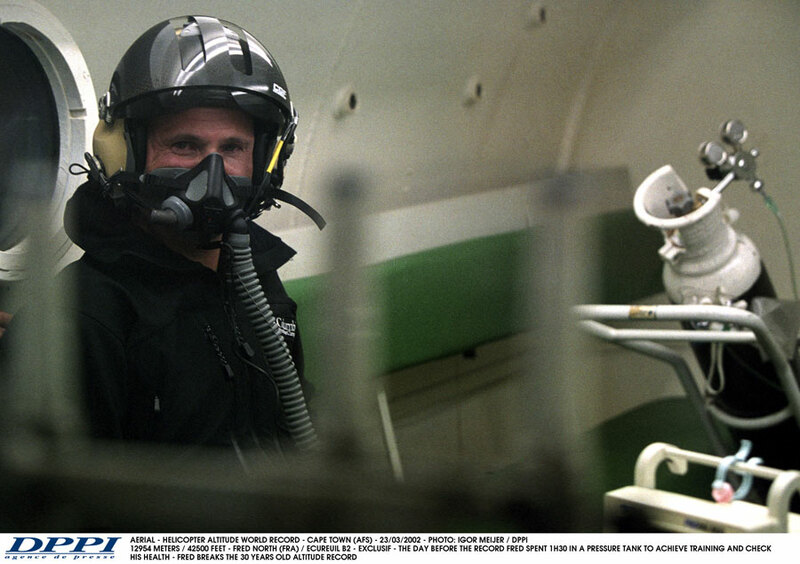 His oxygen mask was giving little by little the vital air to the pilot. The turbine and the rotor worked properly. The 8000 meters were almost reached. At this altitude, physical risks became real. In fact it would be really risky if he wasn’t wearing his thorax compression jacket, as the air in his lungs without external pressure could kill him. Saying so, something started to bother him. More and more he was going up toward the big blue, the pilot felt his jacket blowing abnormally. He started to have trouble breathing. A quick call on the radio to the technicians on the ground confirmed his intuition. The regulator valve pressure didn’t work properly. If he didn’t act quickly, Fred might suffocate. The problem was located: his parachute strap, tightened on his shoulder, stubbed out the valve. With his left hand, Fred managed to put his fingers through his suit, and in extremis, to deflate the mad jacket. After few anxious minutes, the pilot was breathing normally again. He had made it. This unwanted test didn’t diminish his mental strength. Confidence was coming back to him. But he still needed to go further up. The atmosphere, in the cabin, was unreal. The distance between the ground and Fred was growing. Breathtaking. 38500 feet. On the radio frequency, a human voice breaks into the cold silence. “What’s that?” questioned the B-747 pilot from South African Airways, flying in the area. On his radar, an unusual echo. 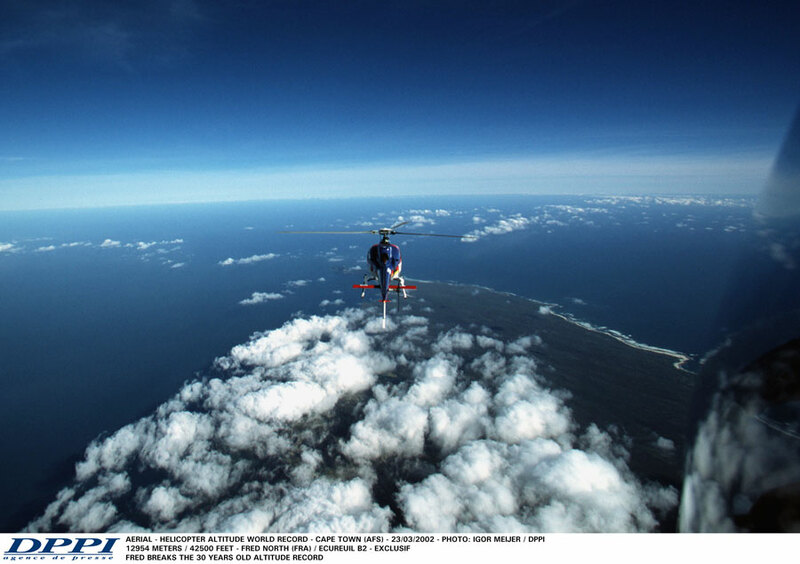 “It is just a French man who is attempting to break the world record on a helicopter. Don’t worry…” answered the air traffic controller of Cape Town. “Is he crazy?” yelled the pilot of the Boeing. Fred didn’t miss a word. And what if he was right? The comic of the situation didn’t eliminate all the efforts made during those last months. No Fred was not crazy. Or just enough to exceed the limits. But the pilot didn’t think about that. He had other priorities! As they thought, the higher it went, the slower the Squirrel got. The power of the engine was four times less in this atmosphere than at a lower altitude. He had to keep on getting the rising currents, the famous pump. The minutes stretched little by little. Psychological pressure was high. Higher, higher and higher… The vibrating waves that the rotor made was unusual. Mechanically, the engine arrived at its higher level of performance. The helicopter went up and down and up again. Fred fought with the stratospheric molecules. It had been an hour and a half that he was in the air. The limits had been reach. It was time to go down now. The previous experience of Jean Boulet shared, Fred decreased slowly the collective pitch to avoid a flame out and engine failure. Everything was fine. The helicopter was slowly going down. A more frank pressure on the collective pitch and… the turbine shut down. They thought of it. On autorotation, the Squirrel kept on track. The pilot remembered the best moment to restart the motor. At 12000 feet, the turbine can be reactivated and the engine can continue normally. Fred North got back to the departure point, happy but exhausted. “I will never do it again!”. As a message from the heart, as a confession, these words tell us a story. The story of a man who kept his engagements, who went over his own resistance limits, over old demons, over the 12954 meters, somewhere unfathomable.